As Zimbabwe prepares for the opening of the 2019 tobacco marketing season March 21, the local market is hyped up in anticipation. In 2018, Zimbabwe produced an all-time high of 252,6 million kgs of leaf tobacco and raked in $892 million from exports of 184 million kgs of the commodity to the world market. Tobacco farming has recovered spectacularly in the last decade from the 2009 season when production had plummeted to less than 50 million kgs per season. Currently, tobacco farming provides direct employment to more than 171 000 small scale farmers who supply 80% of the crop and support over 1,2 million direct dependents. The industry also adds 50 000 indirect jobs in the value chain with auction houses, merchants, processors, cigarette manufacturers, input suppliers, retailers and financiers being direct benefactors. Zimbabwe is now the largest producer of the golden leaf in Africa and 6th largest in the world. Over 66 countries in the world consume Zimbabwe's highly regarded flue cured tobacco with China, South Africa, Belgium, UAE and Russia being the biggest buyers. 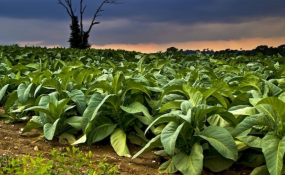 Zimbabwe is managing to relive its glory days in tobacco production, thanks to the liberalisation of the tobacco industry under the contract farming system, farming inputs credit schemes and export incentives availed by the Reserve Bank of Zimbabwe (RBZ). Tobacco farming is pivotal to Zimbabwe economically and socially, therefore efforts to grow the industry should be welcomed by all stakeholders. With the recent announcement that tobacco farmers and merchants will retain 50% and 80% of their tobacco export earnings, production is set to increase from last year's figure and exports are set to top $1 billion per annum by 2020. A lot of players are joining the value chain and the number of contracted small-scale farmers is set to increase as well. However, Zimbabwe is missing at least $5 billion annually through exports of raw tobacco to various countries. These countries further process the tobacco and export cigarettes which fetch higher prices on the world market. Zimbabwe exports almost 100% of its flue cured tobacco as threshed or semi-processed (cut rag) and only a small percentage completes the whole production chain to manufacture cigarettes locally with British American Tobacco (BAT) and Pacific Cigarette Company leading the pack in cigarette manufacturing. The average export price for raw tobacco from Zimbabwe was $4,85/kg in 2018 while the average price for cigarettes was $32/kg. By exporting the same amount of kgs (after factoring in weight losses in manufacturing), Zimbabwe could have realised $5,8 billion in one year. Zimbabwe exports raw tobacco to China, South Africa, Britain, United Arab Emirates, Belgium, New Zealand and Turkey which proceed to manufacture billions of cigarette sticks and export them at higher values under renowned brand names such as Marlboro, Camel, Davidoff, Newport and Dunhill. This simply means the market for processed flue cured tobacco and cigarettes is vast and lucrative enough to warrant policy change from Zimbabwe. A closer look at some of the tobacco processors from South Africa, Botswana and UAE shows a worrying pattern where Zimbabwean nationals or former investors in Zimbabwe decided to set up processing plants in those countries due to the enabling business climate they were afforded. Zimbabwe bears the brunt of tobacco farming from massive deforestation and poor infrastructure especially damaged roads. Therefore it is imperative to implement policies that ensure the country benefits more from tobacco farming than countries that only engage in tobacco processing at the top end. The government needs to implement policies that ensure value addition of tobacco in Zimbabwe. One of the best ways to increase tobacco value addition locally is through export market development and facilitation for cigarette manufacturers based in Zimbabwe. The Zimbabwean market is relatively small in terms of cigarette consumption and consumers lack the necessary buying power due to the economic downturn. As such, export-riented production should be our priority focus as a country. Foreign trade missions stationed in various countries and other target markets should offer trade facilitation for local manufacturers in those countries. This should be a low hanging fruit because the 66 countries that import raw tobacco from Zimbabwe are known and penetration of the finished product in such markets should not be difficult provided the exporting company gets export facilitation. Export facilitation can range from government-funded exhibitions in the target markets, credit guarantees, insurance, advocacy and other commercial arrangements that make product penetration easier and competitive. Local producers can also produce global brands under licence from renowned companies. Once local producers secure supply contracts for cigarettes abroad, their production capacity will grow and the percentage of tobacco value added locally will increase. An indirect measure to compel value addition locally can be through imposing non-tariff or tariff barriers on exports of raw tobacco from Zimbabwe. It may be argued that merchants will resort to smuggling the crop out of the country but tobacco is rather too bulky to be smuggled off radar. Simply put, non-tariff or tariff barriers should make exports of raw tobacco uncompetitive to local merchants or entities involved in tobacco marketing. Merchants involved in exporting raw tobacco should not be treated in the same way as those that export cigarettes; licence and customs wise. Policy sweeteners can be subsidies or loans to cigarette manufacturers. Producing cigarettes locally should have irresistible incentives that lure more investment to Zimbabwe (close to product source) than to neighbouring countries. From a forex retention point of view, processors and manufacturers should be allowed to keep 100% of their export proceeds by the RBZ. Capacitating the current processors and cigarette manufacturers to produce more for the export markets is also a must. Developments in production capacity should ordinarily follow export markets development so that investment in production lines can be easily motivated. The local processors have limited production capacity to meet demand from other markets due to equipment constraints and cost of doing business locally. A long-term approach to lowering the cost of producing cigarettes locally would need to be pursued to balance tax collections and foreign currency generation. Duty-free importation of production equipment is a must for tobacco manufacturers. The benefits of value adding tobacco in Zimbabwe are immense. These range from higher export earnings, local employment creation, economic (GDP) growth, widening of the tax base, downstream value creation, economic diversification and manufacturing capacity development. These benefits will uplift the economy in terms of balance of trade, considering the country's perennial deficit position when it comes to the current account. Value addition in the tobacco industry has been talked about in equal measure to other sectors of the economy such as mining and agriculture without any tangible efforts on policy implementation or follow through by the government. If policymakers are told that what Zimbabwe is getting through raw tobacco exports is only 15% of the billions missed in exports of the finished product, maybe this will sound alarm bells for the much-needed action in terms of policy. Bhoroma is business and economic analyst. He is a marketer by profession and holds an MBA from the University of Zimbabwe (UZ).